FLEX-BAND? 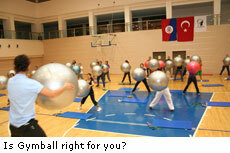 GYMBALL? PILATES? Which is Right for YOU? The Physical Education and Sports Center is hosting an Aerobic/Step Introduction Night, Tuesday, October 14. This is your opportunity to learn everything you ever wanted to know about Pilates, Yoga, Tae-bo, Flex-Band Gymball, and Abdominal Workouts. Just stop by the Student Dormitories Sports Hall at 6:30 p.m. You can register at the Student Dormitories, Main and East Sports Halls. If you miss Aerobic/Step Introduction Night, don't worry. You can still get involved in any of these fun, fitness filled activities. Feel free to go to the Sports Center, call ext. 1325 or 3186, or email Ahsen Küçükdurmaz at ahsen@bilkent.edu.tr to find out more!